Can time restricted feeding make you fitter? DISCLAIMER: You need to do the basics really well first before thinking about the approaches that are covered in this article. Eat the right amount of food for your training volume, eat high quality food, sleep 8+ hours a night, and manage your stress. Over the last decade, there's been an increasingly loud movement that says intermittent fasting (IF) can improve life span, cure cancer, and turn you into a super hero. But is it everything that its cracked up to be? We're going to dig into the science here. We're also going to talk about a new approach to dieting with a similar theme called Time Restricted Eating, which has a similar concept but with a different implementation. The goal is not to say whether these approaches work for weight loss, they do, but to figure out if there's some magical reason, or if its simply because people eat less when given less time to eat. At a high level, there are studies that show that intermittent fasting (8 hour window to eat, 16 hour fast) can improve weight loss, inflammation, and insulin sensitivity. One common criticism of many of these studies is that calories are not controlled in IF protocols, so most of these effects likely have to do with simply eating less food, as people tend to eat less if given less time to eat. This is especially true when we stop people from eating at night, since emotional humans are most likely to binge after 8 PM and not in the morning. 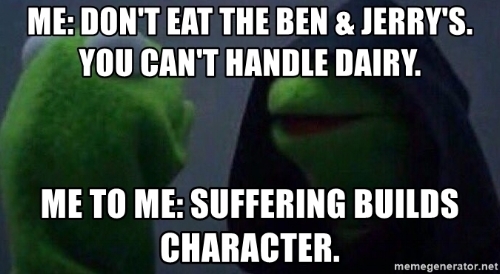 As James Smith would say, when was the last time you crushed a pint of Ben & Jerry's right after waking up? Additionally, a recent study basically came to the conclusion that intermittent fasting was NOT a better diet strategy over the LONG term than traditional dieting, and that you were less likely to stick to the diet overall. OUCH! There are a lot of criticisms about that study, but I don't think it can be entirely dismissed. So if you were tracking your diet with a macro-counting approach, the thought is that there shouldn't be a HUGE benefit to time-restricted eating. Additionally, when you add in the fact that a significant percentage of the clients that come to M2 are doing a ton of exercise and generally under-eating to begin with, giving them less time to eat seems like a bad idea. Of course there's a ton of other reasons to try IF, as there are a whole slew of claims that it can reduce cancer risks and extend life span amongst other things. However, being blunt, the research on this is still very young and needs to be extended further before final conclusions can be drawn. One last comment for athletes: eating all the food you really need to eat in an 8 hour window is HARD and can be rather uncomfortable, especially when training for 4 hours a day, if not longer. Your goal is to also time the eating window into the the normal waking hours, with the goal of aligning your dietary intake with your circadian rhythms (AKA your body's natural 24 hour clock). Here's what the results basically showed. 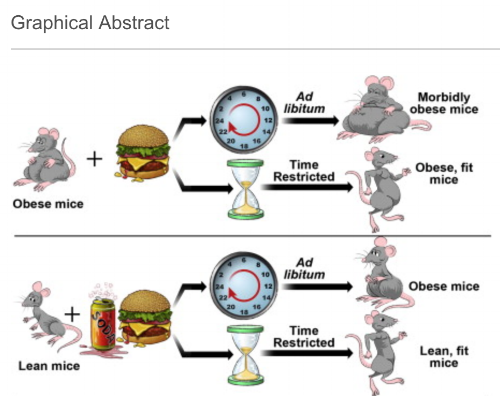 Putting mice on a high fat diet and letting them eat throughout the full 24 hour clock induced obesity and changes to their metabolic gene expression that are related to circadian rhythms (basically they got fat, and the ability to use carbohydrates vs fat stores was disrupted). 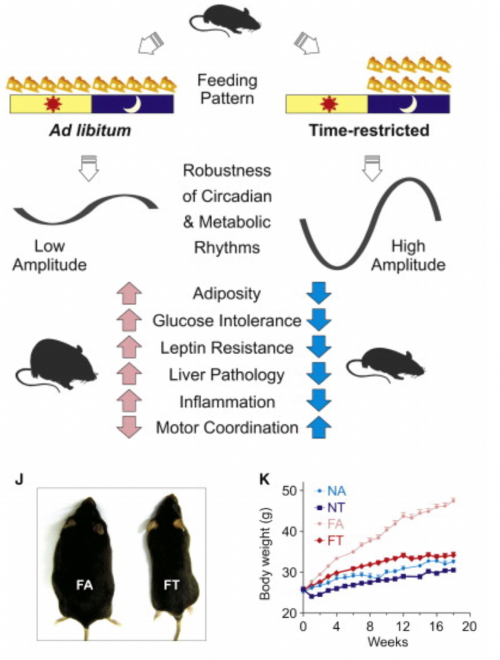 Putting mice on a high fat diet but RESTRICTING their intake to a shorter feeding time prevented disruption of their metabolic pathways and resulted in less obesity. Pretty damn cool... OK, so the same group followed this study up with a second, more in depth analysis, again in mice. Here are the groups (the goal was to model factors that cause obesity and metabolic disease). High fat, high fructose group with and without time restricted feeding. The authors of the study actually put together a pretty nice cartoon of the major findings, which helps explain a really complex paper. I'll explain more below. Ad libitum means the mice could eat whenver they wanted. The cheeseburger represents high fat and the soda represents high fructose. Most of the health benefits only occurred when the time restricted feeding (TRF) window was less than 12 hours. Interestingly, the 2 day "free weekend" with ad libitum eating did not harm the overall results of TRF. I refuse to use the term "cheat meal" but thats what they're going for here. TRF mice had improved insulin sensitivity and an improved lipid profiles, lower levels of systemic inflammation and healthier liver function. TRF mice had increased levels of a protein called PGC-1a, which controls mitochondrial biogenesis. (Mitochondria are basically the "power plants" of your cells). TRF mice had increased muscle mass compared to non-restricted mice. The reasons for this are still unclear, but its a pretty cool finding. Researchers did also note increases in the molecule NAD, which has been linked with longevity and muscle mass retention, but it was just a correlation. A study with humans was also performed, but it was basically observational and as calories were not controlled between groups, its hard to read too much into the results. The only conclusion of note really was that, "when overweight individuals with >14 hr eating duration ate for only 10-11 hr daily for 16 weeks... they reduced body weight, reported being energetic, and improved sleep. Benefits persisted for a year." So... did they lose weight because they ate less calories or because they ate them in a smaller time frame? We cannot tell here sadly. If you want to learn more about this topic, Rhonda Patrick does a GREAT job going into details on this podcast with Joe Rogan. While there's a ton of research on intermittent fasting, we still don't know for sure what the benefits of it really are and if it really is better than other dietary approaches. TRF is even LESS well studied and well controlled human trials need to be performed, but the initial research from the Salk Institute is really compelling. All that said, if you're looking to lose weight and are sedentary or are training 3-4 days a week then restricting your window to somewhere between 9-12 hours seems like a good idea. If you're looking for increased endurance capacity, then you should be at least intrigued by the idea of restricting your eating window into the 9-10 hour range. To be clear, you will have to work HARD to structure your meals within that window, to ensure that you have pre workout and post workout nutrition are still on point. Remember, do the basic things right first, then start worrying about the finer details at that point.